Sanctions regulations in the U.S., U.K., European Union, Canada and Australia for the separatists in eastern Ukraine and their backers in Russia extend beyond the published names of individuals and entities. 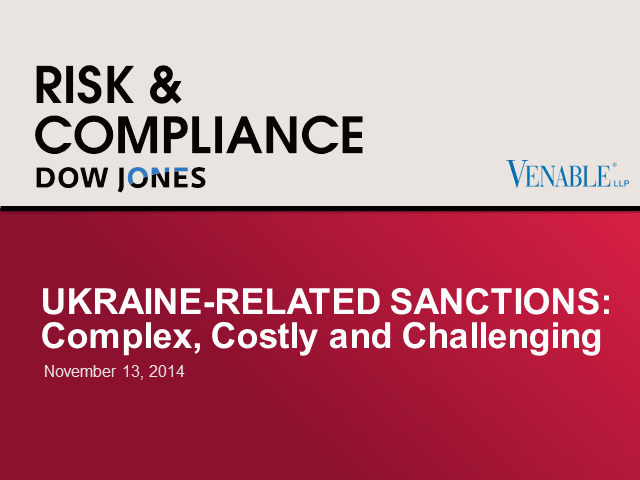 Join this joint webinar with Dow Jones Risk & Compliance and Venable LLP to navigate the minefield of these new sanctions and make sure your organization is compliant. Join Eric A. Sohn, Director of Business Product, Dow Jones Risk & Compliance and Patrick Taylor, CEO, Oversight in this joint webinar to help you better identify the true risks of travel expenses in your organization. Monitoring for FCPA/anti-bribery violations and continuous enforcement of your Compliance Program now requirements for any business transaction, register today for the webinar and make sure your firm is compliant. Join The Wall Street Journal's Dan Keeler, and industry experts, including Dow Jones Risk & Compliance Data Strategist Nicholas Grimaldi, to discuss conducting comprehensive due diligence to mitigate risk when entering into frontier markets. Adhering to international maritime sanctions requirements can be challenging in today’s regulatory landscape. Join Dow Jones Risk & Compliance and experts from HFW and Pole Star for a discussion on best practice in shipping compliance. Learn about regulatory developments -- including the latest UN Security Council communiques on "Sanctions compliance for the maritime transportation sector" -- and leverage case studies on the use of enhanced sanctions data and monitoring tools to mitigate sanctions risk. Preparing your organization for the inevitable cyber attack could be the difference between serious business disruption and minor inconvenience. This webinar will focus on what organizations need to consider in advance of an attack to ensure that risks are mitigated. Dow Jones’ own Head of Cyber Content and Data, Rob Sloan, will be joined by two specialists who will share their experience and expertise. Compliance with the Foreign Corrupt Practices Act (FCPA) has become increasingly important for not only for corporations but for their supply chain partners as well. Join this webinar with Compliance Week's Contributing Writer Tom Fox for information about the latest trends in FCPA compliance, as well as a discussion of recent enforcement actions by the Department of Justice (DoJ) and the Securities and Exchange Commission (SEC). Join Eric Sohn, Director of Business Product, Dow Jones Risk & Compliance, as he discusses the recent FinCEN guidance and how the Dow Jones Marijuana-Related Businesses List can help firms effectively and efficiently address the challenges of marijuana legalization. The Dow Jones State of Anti-Corruption Compliance Survey, now in its fifth year, surveys compliance executives globally for their views on the regulatory landscape and its impact on their businesses. Take a look at the current state of Anti-Corruption Compliance and see how Dow Jones solutions enable risk and compliance professionals to meet regulatory requirements. Join Lindsay Meyer, Co-Managing Partner of Venable - International Trade Practice, and Joel Lange, Director of Sanctions at Dow Jones Risk & Compliance as they discuss the implications of the new Iran reporting requirements and share appropriate recommendations. If your company is registered on a U.S. exchange and has global operations, it is advisable to understand the far-reaching implications of, and assess your compliance with, this new requirement, to timely comply by February 6th. A recent survey of global banks by Celent and Dow Jones Risk & Compliance found that Chinese Commercial Codes (CCC) represent significant compliance risks, yet few banks are addressing these issues seriously as they await some industry wide standards and frameworks to emerge. Dow Jones and Celent have released a whitepaper outlining key survey findings entitled "Chinese Payments and Sanctions Compliance" at SIBOS, Osaka. Join Neil Katkov, Sr. Vice President at Celent and Joel Lange, Director of Sanctions at Dow Jones who will present the key findings of this global survey and share appropriate recommendations and measures. Understand the potential sanctions risks associated with Chinese names and codes in payments. Join us for the third webinar in our new Benchmark Series: Anti-Corruption Compliance - High Risk Industries, the Energy Outlook to see how businesses are responding to global anti-corruption compliance in high risk industries. Fast-moving markets cut across all asset classes and geopolitical borders. To succeed in today's global marketplace, you need the bigger picture. We're dedicated to keeping you on top of trends with deeper, broader coverage of breaking market news. What will impact your trading and investment decisions today and tomorrow? What are market players talking about? Hear about global macro and equities trends in our hour-long live webinar, "It's a Correlated World After All"
Join Factiva for a look at five economic and cultural trends that will impact your marketing strategies in 2012 and beyond. This summer, Dow Jones Risk & Compliance commissioned Celent to conduct a study on the complex challenges facing banking institutions today. Join Neil Katkov, Senior Vice President of Celent, for an interactive review of his findings in a Dow Jones Webinar on Wednesday, 16 November at 10am EST. World-class publisher of newswires, Web sites, newspapers, magazines, radio and TV.